This post is the second in our series on living in historic districts in Winter Park. Two weeks ago, we profiled Elizabeth and Jim Faiella, who live in a Victorian cottage in the College Quarter. 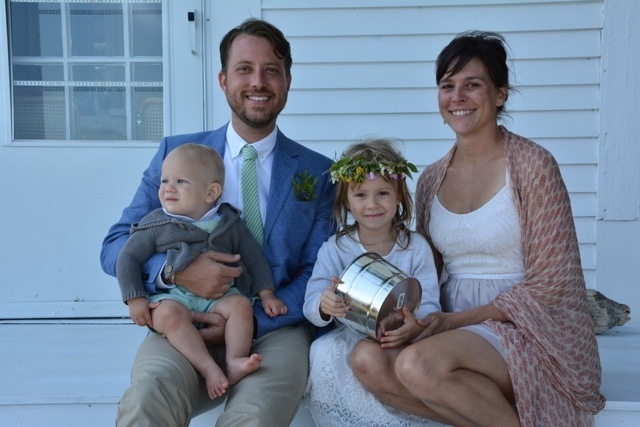 Here, we talk with Hannah Miller, who recently purchased a 1930 wood-frame modified bungalow in the Virginia Heights East Historic District with her husband Wade. The Millers have two children, Sabine (5) and Ethan (1). After 16 years as a displaced Floridian, Hannah Robertson Miller has found her way home to Winter Park. A third-generation Winter Parker, Hannah was anxious to try something different after she graduated from Trinity Prep in 1998. Her interests in art and architecture, culture and and social activism, led her to attend college in Vermont, law school in Austin, and to live and work in Boston, Santa Fe, and Macon, Georgia. However, after she and her architect husband Wade had their two children, they began to think about moving back to Winter Park to be closer to her parents Pat and Randy Robertson. On the verge of moving into her dream house in the Virginia Heights East Historic District, Hannah is discovering that the sense of place she found so attractive in other cities is right here in her own backyard. And she wants to keep it that way. Preservation Winter Park: You’ve lived lots of places with well-preserved historic districts. I have always sought out those particular areas. In Santa Fe, I lived on a street that had the only mud plaster adobe house left, with the traditional interior courtyard. In Macon, I lived in a precious historic neighborhood, right across the street from the oldest Catholic church in Georgia. PWP: In terms of economic development, you and Wade are the very kind of people that communities are interested in attracting—young, creative, educated, and community-minded. If there had not been historic neighborhoods in Winter Park, would you have been interested in moving back? 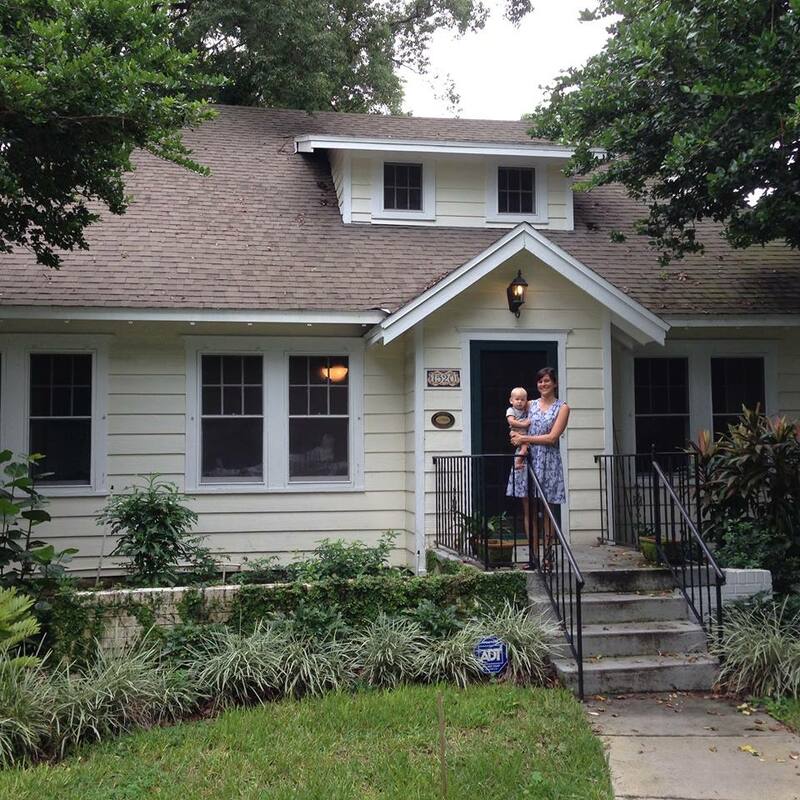 I felt very strongly that I would only move back to Winter Park if I could find a house in a neighborhood that had a higher concentration of historic homes. One of the reasons that I love Winter Park and our neighborhood is that it has this texture, this connection to the past, so that when I’m on a walk I can feel a connection to all the people who lived here before. I’m a third generation Winter Park resident, and I feel connections to my parents and my grandparents. I think about how this city started. Because it has its roots from New England, and I have spent time in that part of the world, so I feel a connection to that also. It has a real sense of place. Obviously, between the lakes and plant life it’s a place of great natural beauty. But growing up here, with grandparents who lived in a historic home (see blog post at Schecnk House), I had a real sense of the preciousness of the architecture, even as a young child. As a family we lived one year in Palm Beach, when I was 14, and I remember that I’d get on my bike after school, and I’d ride down the Lake Trail, and for my own pleasure I would go architectural touring. I’d look at all the houses that I thought were the most unique and beautiful. So I’ve always had an appreciation for that. PWP: What do you love about Winter Park? In addition to the architecture, I love the village quality. The houses are connected to one another, and they have a relationship with one another, and to me that’s one of the most important aspects of preserving the integrity of a neighborhood. It doesn’t put one house above the others; it considers the whole as a community. And when you have these huge houses that are out of scale, dwarfing the homes next door, it changes the feeling of the neighborhood. Architecture is obviously a way of making place but it’s also something that makes community. I appreciate in neighborhoods like the College Quarter and Virginia Heights that there is this feeling of the homes being in relation to one another. And I love that. PWP: Are you concerned, living in a historic district, about being restrained if you want to make changes to your house somewhere down the road? Well, we are in the middle of a 9 month interior renovation of our house. So I’m not concerned at all. I need to mention this because it was so disturbing to me when we bought our house. I had been eyeing this house from afar for 2 years. I even had a folder on my computer with photos of this house. When we did ultimately buy the house, the previous owners gave us their plans to remodel that they had already had approved through the historic preservation board. To me, the changes that they had proposed would have made the house unrecognizable. So, if anything, I think the rules are too lax. If changes that extensive got through, it’s disingenuous to argue that the current design guidelines are too restrictive. But, even when the rules are being properly enforced, all it takes is a little creativity to really make something work for your family. We are in the process of making changes on the interior so that there are no closed-off rooms, more long vantage points so that I can see the kids from where I am, and to make it easier for entertaining, more conducive to a modern way of living. And we didn’t change a single exterior wall. The home looks as it did on the outside for many decades. PWP: Aren’t you afraid of foregoing the opportunity of selling the house as a tear-down for a huge financial windfall? What if someday you really need the money? And do you think it’s fair that others couldn’t avail themselves of such an opportunity as well? It’s the very hypothetical you’ve given that convinces me how important these kinds of protections are. There are all sorts of ways to justify short-sighted financial decisions, when the reality is that there’s something greater that we’re working towards, in terms of preserving what’s really special about our community. I wouldn’t be seeking out a historic home if I didn’t have those values. I feel very strongly about this issue. There are plenty of other homes in this community that don’t have historical value. There’s no lack of a variety of housing across this market. There are plenty of Magic Players’ dream homes out there. It’s not the city’s responsibility to guarantee its citizens’ rights to make an obscene profit, at the expense of the community. A home to me is not a profit center. It’s a place of enjoyment. A place to value while you’re there. PWP: That’s your opinion. But is it fair to force that on others? Community is important. I don’t care just about myself. I care about my neighbors, and building community for my family. I want my children to know what it’s like to be a part of something bigger than themselves. This is just how I live in all areas of my life. 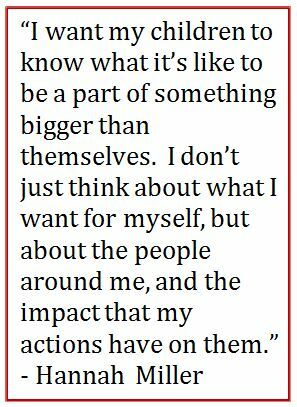 I don’t just think about what I want for myself, but about the people around me, and the impact that my actions have on them.